Typically I'm not one for frozen foods, however they do have their place in the land of convenience. I just try an opt for the least processed options. In the land of frozen foods, good choices, not tainted with a gazillion additives and preservatives, are few and far between. Shopping at Walmart last week I found 2 items, both by Goodheart's Brand. I can't find a website for these specific products, but there is a general site and it looks like they might supply food for restaurants. Interesting. I bought the chicken broccoli and the beef merlot versions. 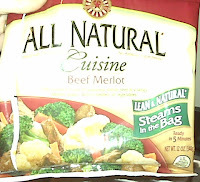 Hubs ate the chicken broccoli and I tried the beef merlot today. As for taste, the first word that came to mind was "fresh." The broccoli, cauliflower and carrots all tasted fresh. The beef? Well, it was frozen beef, but the pieces weren't so tough that you thought you were chewing a piece of Laffy Taffy, as is usually the case with frozen beef (in my opinion anyway). I added some red pepper flakes and it was pretty good. 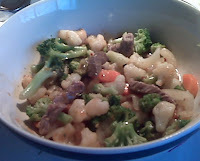 I would eat it again, if I really wasn't watching my intake of broccoli, cauliflower and soy because of my Thyroid issues. It is two servings per bag. I can eat the whole bag; I know... *gasp*. Cooked veggies go down easy, plus they say they are 1 cup servings, but I think they're talking about an unpacked 1 cup. Still at $2.50 a bag, it's a great, minimally processed choice over other frozen choices. 150 calories per serving, 3 grams of fat and 15 grams of protein -- so there's some value to the nutiritional content, though it is not 100% "all natural" as the packaging claims; there are a couple additives. I do appreciate the effort Goodheart's makes to put out something that is a healthy option among the frozen food meals. I also appreciate the seemingly full disclosure on the label. No secrets. *As for the unmodified corn starch, at least it is "unmodified", meaning no chemical additives. As for the Xantham Gum, it is a polysaccharide used as a food additive and rheology modifier. It is produced by fermentation of glucose or sucrose by the Xanthomonas campestris bacterium. *As for Guar Gum, it is primarily the ground endosperm of guar beans. The guar seeds are dehusked, milled and screened to obtain the guar gum. It is typically produced as a free flowing, pale, off-white colored, coarse to fine ground powder. * As for the "butter flavor" is made of. 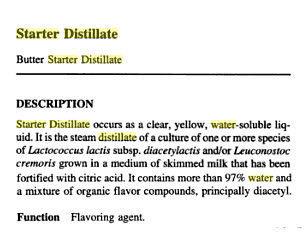 It's a chemical. :( Boo-hiss. Run! Don't Walk! Meet Tricia!! Because You Can't Fake This!